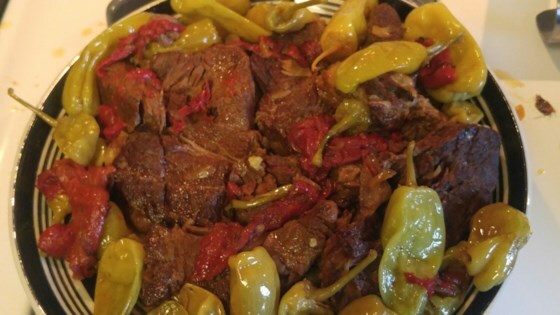 "This delicious pot roast is a definite crowd pleaser!" Pour broth into a multi-functional pressure cooker (such as Instant Pot(R)). Place beef in the pot and sprinkle with ranch dressing mix and onion soup mix. Place butter on top. Add pepperoncinis and juice. Close and lock the pressure cooker lid. Select high pressure according to manufacturer's instructions; set timer for 110 minutes. Allow 10 to 15 minutes for pressure to build. I'm new to the Instant Pot (3qt). I want to try this recipe but the 110 minutes sounds like a lot. Do I need to adjust time for my smaller pot? Help! I made it exactly as the recipe stated and it was AMAZING!! Would definitely make again. I used Oxo Beef rather than onion soup mix but added slivered red onion. The result was wonderful. Everyone in my family absolutely loved this. It was so tender and moist and the flavor was wonderful. Will definitely make this again. I love this recipe! So easy and I love putting the meat over rice! Definitely would recommend this recipe to anyone! Favorite meal ever! It was excellent! I used sliced pepperoncinis so nobody got a mouthful of pepperoncini instead of a small flavoring. Definitely loved how fast it was made in the Instant Pot.